Edgar Ramirez, Sebastian Stan & More Studs Help GQ Style & Hugo Boss Celebrate Amazing Spaces! 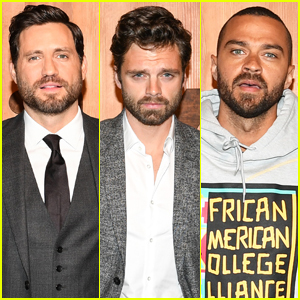 Edgar Ramirez and Sebastian Stan keep it dapper in suits while attending GQ Style & Hugo Boss Celebrate Amazing Spaces Launch held at John Lautner’s Harvey House on Thursday (November 2) in Los Angeles. 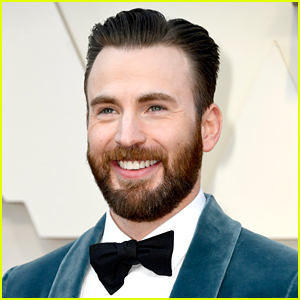 The 40-year-old actor, who hosted the event, and Sebastian, 35, were joined by Jesse Williams, Finn Wittrock, Ricky Martin and his fiance Jwan Yosef, Darren Criss and girlfriend Mia Swier, Noomi Rapace, Jeremy Scott, Miguel and his longtime love Nazanin Mandi, and musical guest Tunde Adebimpe. BOSS partners with GQ Style to take you inside some of America’s most architecturally significant locations. In the first video, Edgar takes you on a tour of Frank Lloyd Wright‘s mysterious LA mansion, The Ennis House, whose distinctive design has served as a location to films such as Blade Runner. Kelly Rowland strikes a pose alongside Monique Coleman while attending Day Two of the 5th Annual Beautycon Los Angeles on Sunday (August 13) in Los Angeles. 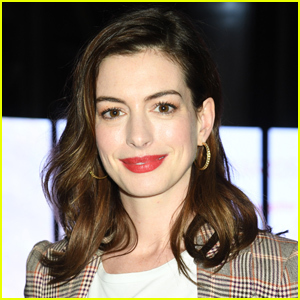 The 36-year-old actress and Monique, also 36, were joined at the event by Simone Biles, Gigi Gorgeous, Jay Manuel, Jordyn Woods, Debby Ryan, Laurie Hernandez, Amanda Steele, Nazanin Mandi, Skai Jackson and EJ Johnson. Gigi had fans screaming and chasing her across the venue to her meet and greet at the Revlon booth. “�’�🏼�’�🤴🏼�’�🏼 Couldn’t stop playing today🥂 @Revlon @Beautycon #ad,” Gigi captioned with one of her Instagram posts at Beautycon with girlfriend Nats Getty. FYI: Debby is wearing a Vince Camuto jacket, pants, and clutch. Kerry Washington, Kate Bosworth & More Celebrate Balmain L.A Boutique Opening! Kerry Washington is the lady in white while attending the Balmain Los Angeles Boutique Opening Celebration held at a private residence on Thursday evening (July 20) in Beverly Hills, Calif. The 40-year-old Scandal star was joined by Kate Bosworth and her husband Michael Polish, Jaime King, Miguel and his partner Nazanin Mandi, Gillian Jacobs, The Chainsmokers – Andrew Taggart and Alex Pall, Teyana Taylor and her husband Iman Shumpert, Monica, G-Eazy, Nick Carter and wife Lauren Kitt, Poppy Delevingne as they celebrated the opening of the French house’s first ever west coast boutique. Also in attendance were special live performers Migos and singer Jaira Burns, whose debut single “Ugly” serves as the musical backdrop for Balmain’s Special Edition Beats Studio Wireless and Powerbeats3 Wireless, which became available on July 19. FYI: Kate is wearing Giuseppe Zanotti shoes. 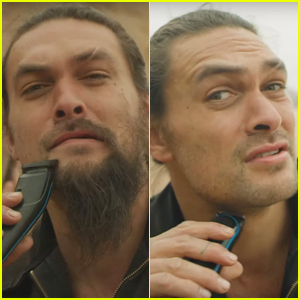 Jason Momoa is one supportive co-star! 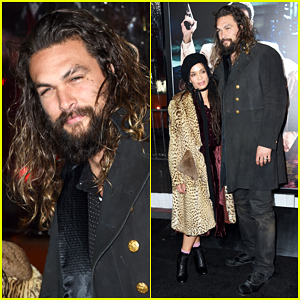 The 37-year-old actor and his wife Lisa Bonet made a rare official appearance at the Live By Night premiere in support of his Justice League cast mate Ben Affleck held at the TCL Chinese Theatre on Monday evening (January 9) in Hollywood. This is the first time Jason and Lisa, 49, have hit a red carpet together in over a year. The last time the couple was spotted at an event was at the InStyle Awards back in October 2015. Jason and Lisa were also joined at the premiere by star of the flick Miguel and his love Nazanin Mandi, Isaiah Washington, Giles Marini, Gil Birmingham and Code Black‘s Emily Tyra. Joe Manganiello, Tia Mowry, & More Ring In the Season at Jennifer Klein's Star-Studded Holiday Party! The hottest holiday party in Hollywood of the season is always producer Jennifer Klein‘s annual holiday party and stars stepped out in full force to attend the event! Tia Mowry and her husband Cory Hardict were spotted leaving the party holding bottles of Health-Ade Kombucha. All of the celeb guests were gifted a bottle of the new “Holiday Cheers” flavor on their way home from the event on Saturday (December 3) at a private home in Brentwood, Calif.
Joe Manganiello warmed up with a cup of Coffee Bean & Tea Leaf’s hot chocolate on his way out. Other celebs who were spotted enjoying the warm beverage included Maria Menounos and her fiance Keven Undergaro. Emmanuelle Chriqui stayed hydrated with a bottle of Icelandic Glacial Water as she exited the event. Hailey Baldwin, Chanel Iman, and Olivia Culpo step out in style while attending the REVOLVE Winter Formal 2016 held on Thursday (November 10) at NeueHouse Hollywood. The ladies were joined at the fashion event by Jasmine Tookes, Jasmine Sanders, Charlotte McKinney, Nazanin Mandi, Poppy Jamie, Chantel Jeffries, Brody Jenner, and Gucci Mane. The event featured a musical performance by D.R.A.M. Chanel shared a photo of herself inside the party posing alongside Jasmine S. and her friend Nickayla Rivera. “LA ❤️�’��’� @revolve,” Chanel captioned the Instagram pic (below). FYI: Hailey is wearing an X by NBD Charlotte dress. Chanel is wearing GRLFRND Denim jeans. Jasmine T. is wearing LPA Dress 61. Jasmine S. is wearing House of Harlow 1960 x REVOLVE Diana Maxi and Tamara Mellon shoes. Olivia is wearing LPA Bodysuit 69 and LPA Skirt 72. Charlotte is wearing LPA Bodysuit 25 and LPA Skirt 64.